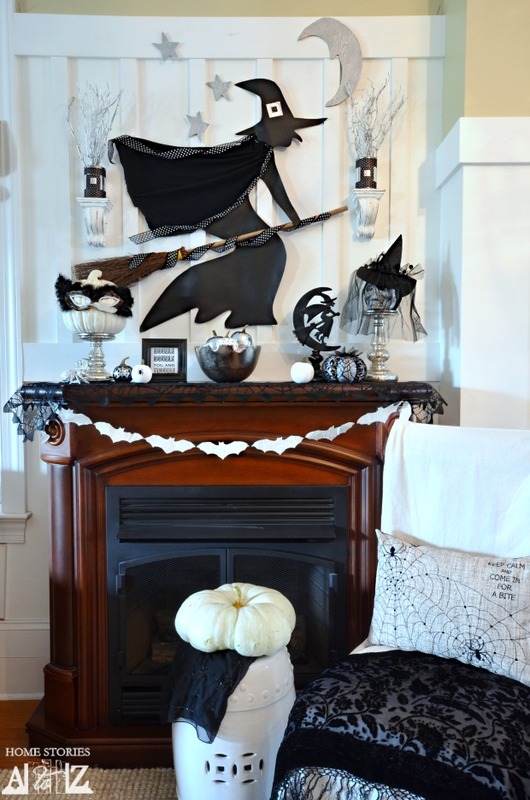 I am so excited to show you this year’s completed Halloween Mantel. 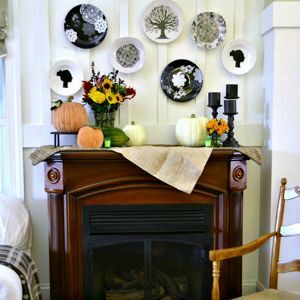 It has been a very long time since I have done a mantel post, and if you are a regular reader here at Home Stories A to Z then you know I love a good mantel post! 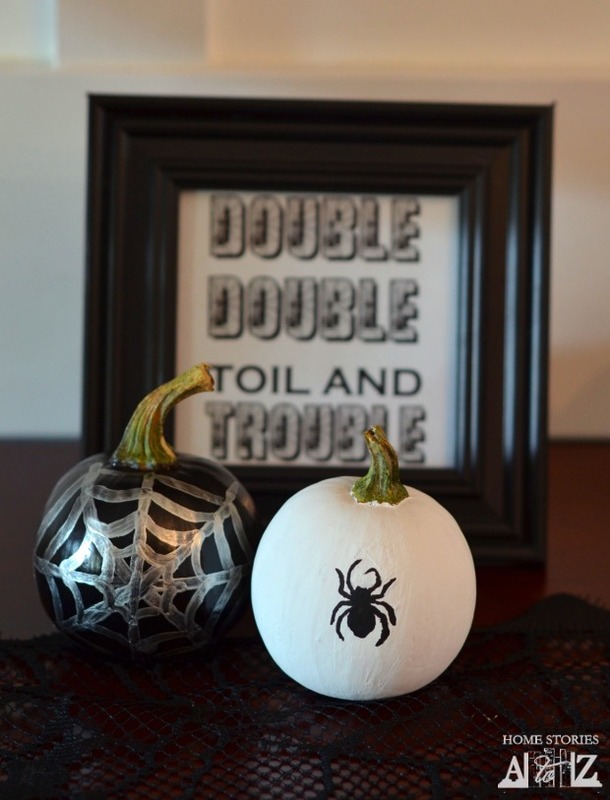 My Lowe’s Creative Ideas Blogger Challenge this month was to decorate for Halloween and freshen up the mantel. Woohoo! That is a challenge right down my alley. 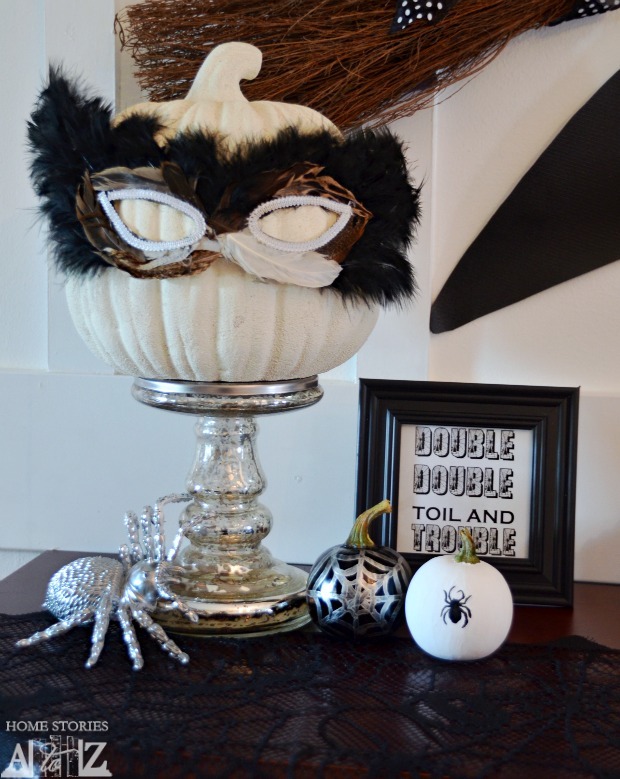 Based on an inspiration photo from Good Housekeeping that I fell in love with last Halloween season, I knew I wanted this year’s Halloween mantel to have a witch theme in white, black, and silver. 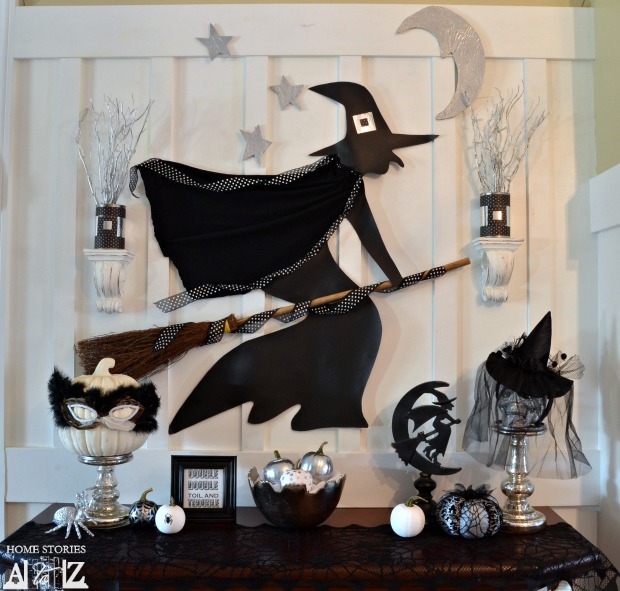 Today I’m going to show you how to create your own witchy mantel and teach you how to make a witch silhouette. I unrolled my black shelf liner and secured it to the wall with Scotchblue tape. Next, I used my 3M projector to project the image of the witch onto my liner and traced around it. I LOVE my 3M projector and use it in decorating all the time. It connects to your computer and can project anything straight from your computer onto your project. The template for the witch can be found here. 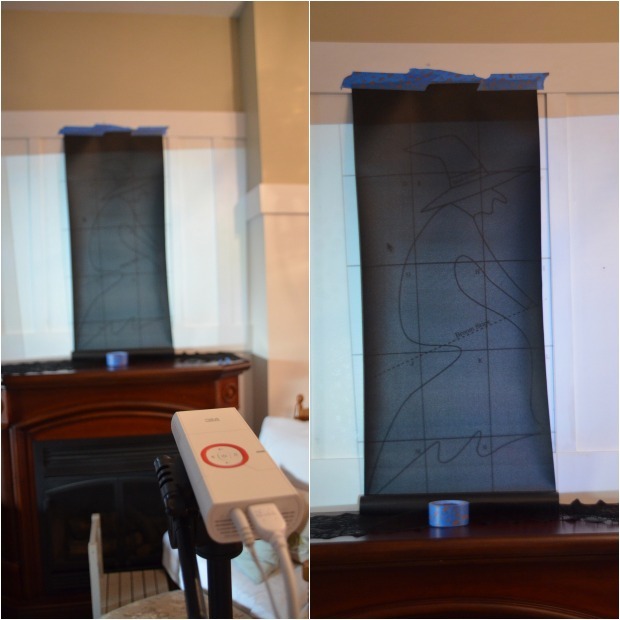 If you do not own a projector you can print out the template, cut around it and trace it onto your shelf liner. You may need to resize the template to fit the shelf liner. Once the witch silhouette was traced, I took it off the wall and cut it out using scissors. The liner cuts very easily and is great to work with. To secure the witch to the wall, I used Scotchblue tape and smoothed her into place. What is a witch without her cape? I used an old black t-shirt of my husband’s to make a cape. Shhhh…don’t tell him. (I kid. He knows and gave me his blessing to mutilate his tee :D. My family is kind of used to sacrificing their belongings for the sake of my decorating at this point in the game.) I cut the t-shirt about 20 inches long and “hemmed” the sides by folding them over and securing with hot glue. The ribbon is weaved through small slits at the t-shirt neckline and hot glued in place. To make the cape look like it was flying, I hot glued it straight to my mantel wall. Do this at your own risk. Hot glue usually peels off without damaging the wall, but not always. I don’t mind repainting a small patch if I need to, but you might :). 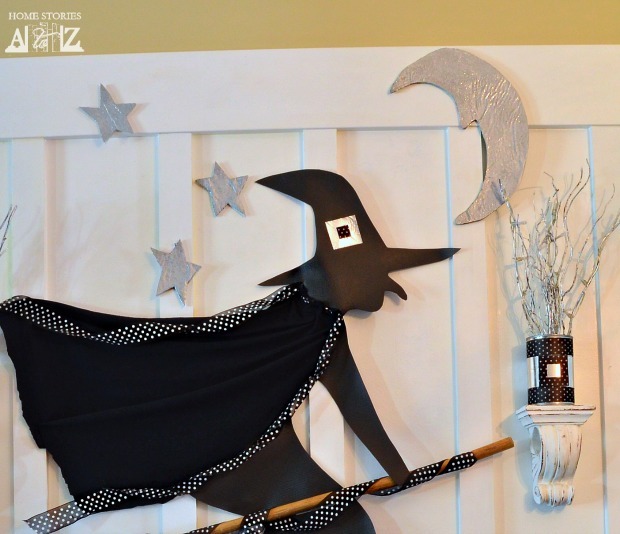 The broom is secured to the wall using command strips, and the witch’s hat buckle is made out of foil tape with a small inner square of scrapbook paper. Isn’t she cute and classy? 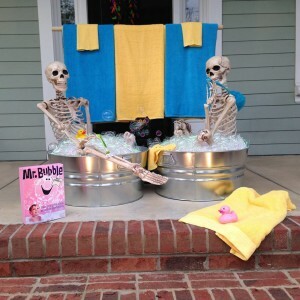 Classy Halloween is about all I can handle for Halloween decorations. 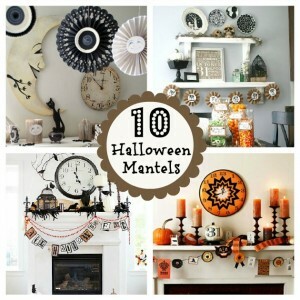 Scary decor creeps me out. To make the moon and stars, I used my 3M projector again and projected the images onto foam board. I used an Xacto knife to cut the shapes out and painted them with silver Martha Stewart glitter paint. They are also attached to the wall using Scotchblue tape. Did you notice the witch’s buckle tin cans? I pulled some cans from recycling and covered them in scrapbook paper and foil tape. The sticks were purchased (and are actually LED lights), but you could easily just spray paint some sticks to achieve the same look. And here are some close-ups of the rest of the mantel! It was a major deal for me to buy a glittery skull this year because skulls kind of scare me. But this one is glittery and sparkly which made it almost acceptable. I needed to feminize her a bit more though with a fancy witch-hat headband ;). The pumpkin needed some mystique as well so she got a feather mask. 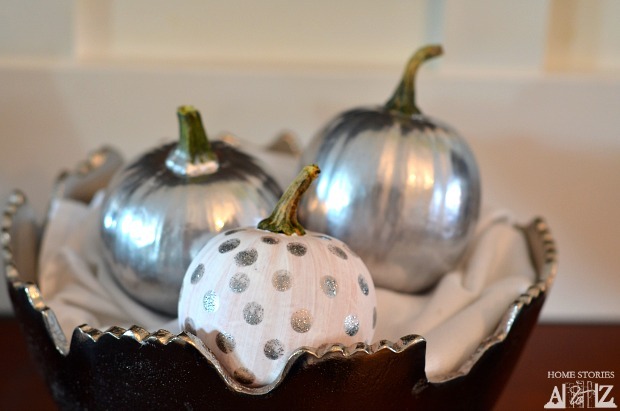 Love my silver pumpkins! I used Sterling Silver spray paint which you can find at a craft store, or you could use Rustoleum Chrome spray paint for a similar look. 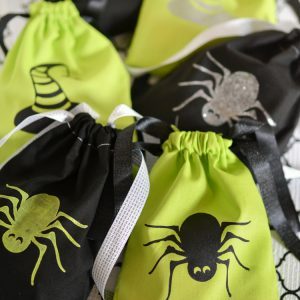 If you follow me on Instagram or Facebook, then you might have seen my spider already :). Yes, I’m notorious for “shopping the house” when decorating. Nothing is off limits. I think this year’s Halloween Mantel is my favorite so far…and I really loved last year’s Spooky Lighted Chalkboard Mantel, my Plate Wall Mantel as well as my Spooky Tree Mantel from 2011. You’ll have to go check those out if you haven’t seen them yet. 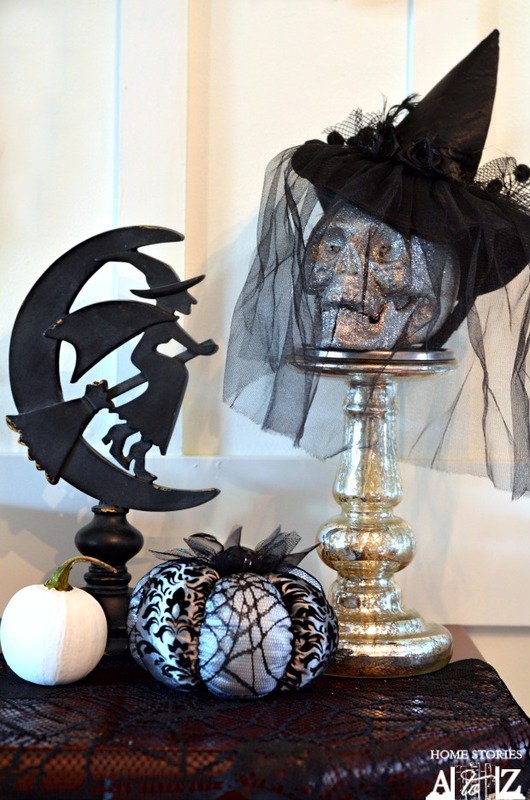 Thanks so much for dropping by and checking out my 2013 Halloween Mantel! 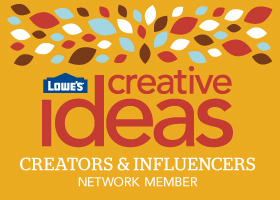 For more fun DIY ideas at Lowe’s Creative Ideas, sign up for the Creative Ideas magazine and app. Several of your favorite bloggers are featured in the app monthly! Beth, this may be my favorite one yet!! I draw and cut out silhouettes on the front of the house and witches seem to be taking over! I love yours! ok, well that at least explains why that spider is so creeptastic! 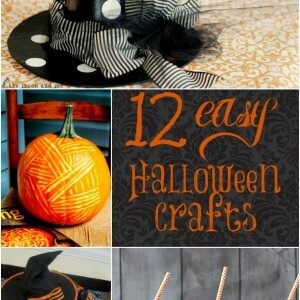 loving the ribbon entwined with the broom, just kicks it up a notch! 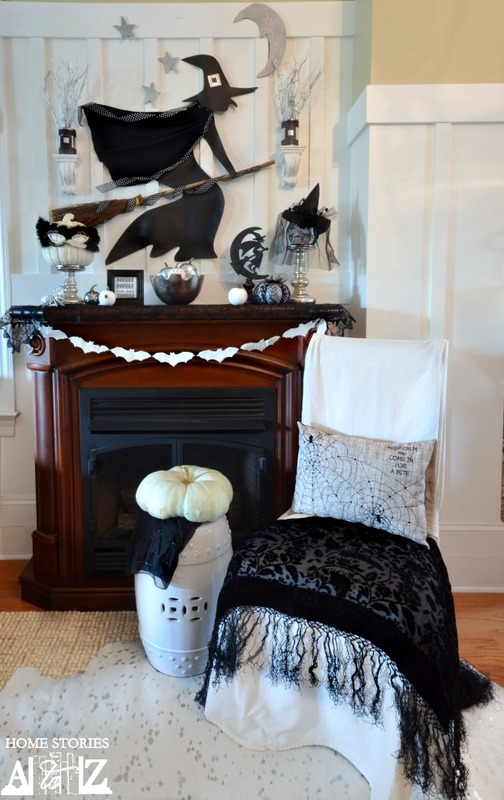 Love your Witch Mantle…just boo-tiful! (ha ha, couldn’t resist that one!). WOW! You went all out. There is so much work put into this and it shows 🙂 I love every little detail! Yay! Thank you Kim :). Thank you so much Phyllis :). 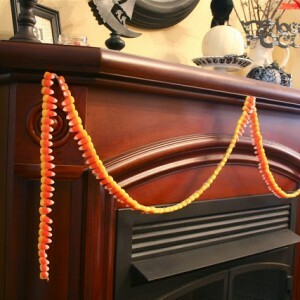 I love this mantle! Wow, you went all out, and it looks amazing. 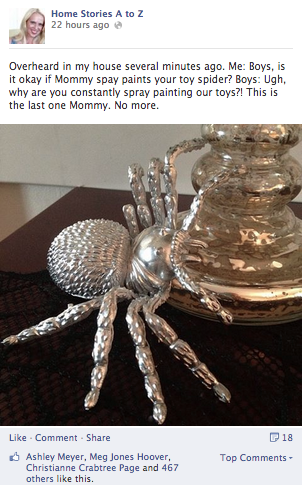 That’s so funny about the toy spider you spray painted. At least your boys roll with it! Ha! Yes, I’m a bit notorious around these parts for stealing everyone’s stuff for my decor purposes :P!